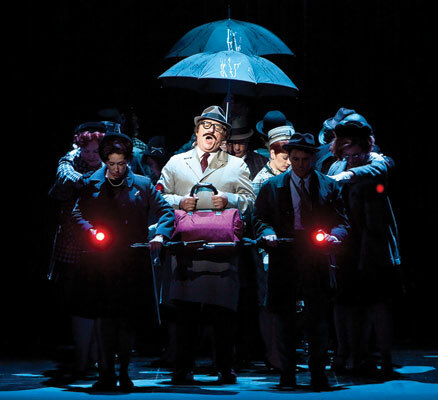 RINGING IN THE OPERA SEASONS: Re: Opera Santa Barbara’s recent world premiere presentation of Stephen Schwartz’s Seance on a Wet Afternoon, the reviews and responses are in, and the jury is wildly mixed. Some lapped up the easy-breezy, Broadway-flavored concoction. Plenty of others left scratching their heads, possibly suffering from a dej vu sensation: It seemed as if Civic Light Opera had returned to the Granada, albeit with a vastly larger budget and stronger singing cast. Congratulations are in order for Opera Santa Barbara’s coup and accomplishment, but there seems a bit of a Faustian pact involved, in which the company got its world premiere by a famed composer, but said composer has no cred in opera-and now we understand why. Meanwhile, the operatic machinery has cranked up its autumnal ritual, and in Southern California-and the West in general-the big news remains the gradual rollout of the LA Opera’s fantastic and fantastical premiere production of Richard Wagner’s Ring Cycle. At the moment, the opera of the West Coast moment is Siegfried, which might seem daunting in its five-hour duration, but which contains plenty of dark humor, fairytale heroics, and sweeping notions of fear and love. Some de rigueur rumblings of official whining bubbled up after the Ring‘s first two installments-Das Rheingold and Die Walk¼re-last spring, citing the price tag ($36 million) and questions of the composer’s dubious anti-Semitic sentiments. But the Ring remains a pinnacle of operatic repertoire, and a necessary mountain to climb for any self-respecting opera company. Wrapped up in the hypnotic surreal circus vision of the : well, visionary : German director Achim Freyer, this Ring is wildly engaging and dreamlike, blessed with a fresh perspective. As Siegfried, duded up in screaming yellow hair and red-then-blue muscleman torso, heldentenor John Treleaven is powerful and vulnerable (power and vulnerability being key aspects to Siegfried’s hollow-hero character). He glows and belts it out in an extended duet with the conniving faux father figure Mime (Graham Clarke) and a gleaming, protracted love duet with Br¼nnhilde (Linda Watson)-albeit his aunt. James Conlon summons up his usual splendor in the orchestra pit, the Wagnerian foundation underscoring Freyer’s epic yet strangely intimate magic tricks on and far above the stage. THE VIEW FROM 50: In the space of a week-and-a-half, we got a look-see and a listen-up at a handful of prominent Americans, including Wynton Marsalis, Merle Haggard, Aimee Mann, the funny folks behind “Wait, Wait : Don’t Tell Me,” and musically gifted musical kitsch-meisters Pink Martini. Blame it on the milestone. After the first wave of UCSB Arts & Lectures’ 50th-anniversary season has passed, it’s a fine time to reflect on the majestic legacy of this presenting body. We may take it for granted at times, but A&L has long played a strong, critical role in what makes a town Santa Barbara’s size unusually rich in cultural offerings. Moneyed residents help, of course, and have helped steer and propel this program forward in the face of ever-increasing budget and economic angst. For this Santa Barbara-bred arts addict, A&L has been a godsend (religious reference intended), going back to concerts by John Fahey and Ravi Shankar in my impressionable adolescence. Other memorable Campbell Hall shows from the misty memory banks include Sonic Youth, the Kronos Quartet (on the night before we bombed Baghdad, for the first time), a raucous and heady fine show by the Art Ensemble of Chicago, when all original members were alive and kicking, encounters with the great Sonny Rollins, and the list goes-and continues going-on. Coming soon, Ravi and Anoushka Shankar (Nov. 1, at the Arlington). CULTURAL CIRCUIT LOADS: In another corner and cultural nook of UCSB, a modest evolutionary revolution is underway, regarding electronic/computer music. Next Thursday night at 7 p.m., Christian Clozier, director of IMEB (International Institute of Electroacoustic Music) in Bourges, France, presents a concert in Lotte Lehmann Concert Hall, with a lecture in the afternoon.